Home/Dinosaur and Prehistoric Animal News Stories, Dinosaur Fans, Main Page, Palaeontological articles/Fishing Ankylosaurs? With the description of a new specimen of the armoured dinosaur Liaoningosaurus having being published, rather than cementing what scientists knew about this Early Cretaceous dinosaur, it seems that palaeontologists are perhaps going to have to re-think this particular member of the bird-hipped dinosaurs, tentatively assigned to the Ankylosauridae. A number of fish skeletons were preserved in association with the fossilised bones and teeth of this little critter, this has, along with an assessment of the shape of some of these bones and an examination of the very peculiar teeth, led to the authors of the paper speculating that Liaoningosaurus was a fish-eater. A sort of armoured dinosaur that thought it was a freshwater turtle. A newly discovered specimen of Liaoningosaurus indicates that these small armoured dinosaurs may have eaten fish. The scientists publishing in the “Journal of Geology” postulate that Liaoningosaurus paradoxus is not only one of the smallest bird-hipped dinosaurs (Ornithischians) so far described, but it might represent the first carnivorous member of the Ornithischia too. To understand a little more about this dinosaur we have to return to the beginning, way back to 2001 when this dinosaur was formally named and described after the near complete fossilised remains of an individual armoured dinosaur were found in deposits that form the famous Yixian Formation of Liaoning, north-eastern China. The fossils were thought to represent a juvenile and as such, with quite a bit of growing to do (it was presumed), the researchers noted its distinct anatomical features but put them down to the fact that many of these traits would be modified as the animal grew into maturity. After all, the body-plan of an armoured dinosaur was quite well known and why should this 34 centimetre-long specimen deviate from that plan to any great extent? One of the stranger features identified in the original 2001 paper was that Liaoningosaurus seemed to possess a large, bony plate, described at the time as being “somewhat shell-like” that shielded the abdomen. This “belly-plate” was reminiscent of the plastron found in turtles. This was the first time that any such structure had been reported on from any member of the Dinosauria. In 2014, a reassessment of the fossil material led by ankylosaurid specialist Victoria Arbour concluded that these structures were more likely to represent fossilised skin. A line drawing of the very “turtle-like” holotype of the armoured dinosaur Liaoningosaurus. 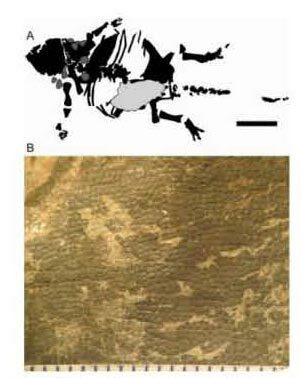 The picture above shows a line drawing of the first Liaoningosaurus fossil to be described (A) with a close up of the skin which was thought to be some sort of protective plate on the abdomen (B). The scale bar equals five centimetres and the dinosaur does resemble a turtle in shape to some extent. 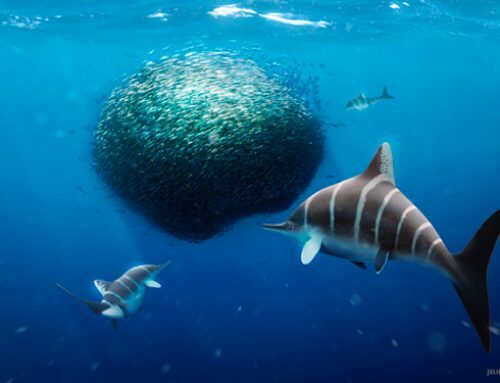 The co-authors of the new scientific paper cite the presence of numerous fish fossils inside the body cavity of the Liaoningosaurus as evidence that suggests that this armoured dinosaur might have been a piscivore (fish-eater). Up until now, it was thought that armoured dinosaurs such as the ankylosaurids were entirely herbivorous. The newly described Liaoningosaurus suggests that these armoured dinosaurs may have eaten fish. In the photograph above the orange marks indicate the location of fish fossils. Could the fish have been sheltering inside the sunken corpse of the dead dinosaur or perhaps scavenging it when they themselves were overtaken by some catastrophic event and died? The corpse of the Liaoningosaurus could simply have to come to rest on the bottom of the body of water that coincidentally also had a number of dead fish lying on the sediment where it landed. Liaoningosaurus was a very specialised form of armoured dinosaur, one that was either fully or semi-aquatic and it fed on fish. Of the three explanations, it is the latter, the piscivore hypothesis, that is favoured by the authors. 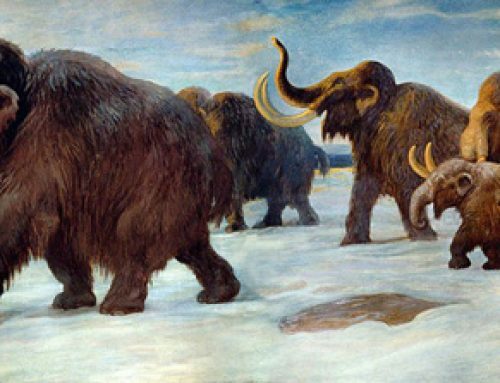 After all, this is not the first case in the Kingdom Animalia of one type of animal adopting a very different lifestyle compared to its near relatives. Take the nocturnal and retiring Pangolin (Order Pholidota), for example. These mammals are the only members of the Mammalia to have evolved large, protective keratin scales over their bodies, ironically superficially similar to the bony osteoderms and scutes of armoured dinosaurs. Pangolins are insectivores, but their nearest relatives the Carnivora are almost all meat-eaters preying on other vertebrates. Both scientific papers allude to the fact that this small dinosaur, a little over thirty centimetres in length, had a number of peculiar anatomical features. The long lower limbs, sharp claws and elongated feet could be traits that reflect the immaturity of the individuals but they also could be adaptations for a swimming habit – could Liaoningosaurus be the first carnivorous Ornithischian dinosaur to be described? Those teeth, oversized for an ankylosaurid and their strange crowns could be adaptations for catching and eating slippery fish. There are teeth present in the premaxilla, once thought to be a characteristic of a juvenile ankylosaurid that was lost as the animal grew up. Teeth in the front of the mouth make sense if you are catching fish for a living. The finger-like, forked crowns are highly modified, they would have made short work of any fish to get within grabbing distance of those powerful jaws. (a) positive dorsal view, (b) negative counterpart of specimen with (c) three maxilla teeth in lateral view and (d) a line drawing showing the forked crowns – an adaptation for eating fish? The photograph above shows the positive slab and the counter slab (the negative) of the fossil. In the bottom left corner there is a close up of three teeth, to the right a line drawing showing the peculiar forked pattern of the tooth crowns. When first described, this little dinosaur was given the trivial name “paradoxus” a reference to the paradox the fossil represented. It could not be decided where in the Ankylosauria clade Liaoningosaurus should be placed, paradoxically, despite the finding of a second beautifully preserved specimen, scientists still have lots of questions to explore when it comes to the smallest armoured dinosaur described to date. This is one dinosaur that certainly lives up to its name.